In the epistemological debate, there are two archetypal and actually diametrically opposed concepts: empiricism and rationalism. Empiricism claims that sensory experience (observation) is man's main (or even sole) source of knowledge, while rationalism claims that his knowledge stems from human reason. Hardly anyone would deny that there is knowledge that comes to us from sensory experience. Take, for instance, the knowledge that water freezes at zero degrees Celsius. It actually takes observation(s) to acquire such knowledge. However, in the field of science, which formulates knowledge that applies universally, irrespective of time and place, rationalism holds that empirical knowledge gained through sensory experience doesn't have the same validity as knowledge deduced from reasoning. In the last decades, the fiat-money supply rose 200 percent year to year, while real GDP increased 50 percent year to year. In the last decades, government tax revenues rose from 10 percent to 50 percent of GDP, while per capita income increased 40 percent. How can we make sense of these findings? Did real GDP increase because of a rise in the fiat-money supply, or did real GDP go up despite a rise in the fiat-money supply? Likewise, one can ask, Did real GDP increase because or despite a rise in taxes? Each of these explanations appears equally plausible. So which is the correct one? The first step towards answering this question is the understanding that employing a theory (an idea of putting together in a systematic fashion the knowledge one has of aspects of reality) is indispensible for observing "facts." There is no such thing as a mere recording of unadulterated facts apart from any reference to theories. As soon as two events are recorded together or integrated into a class of events, a theory is operative. The notion of "letting the facts speak for themselves" without taking recourse to a theory is nonsensical. Mises was aware that people's "reasoning may be faulty and the theory incorrect; but thinking and theorizing are not lacking in any action." How do we know, and how can we make sure, that we employ a correct theory? Fortunately, in social science a satisfactory answer can be given to these questions by taking recourse to a priori theory — meaning propositions that provide true knowledge about reality, and whose truth value can be validated independent of experience. To explain, we have to turn briefly to the Prussian philosopher Immanuel Kant (1724–1804) and his groundbreaking The Critique of Pure Reason (1781). A central outcome of what Kant called transcendental investigation is his discovery of so-called a priori synthetic judgments. A priori denotes a proposition (a declarative statement) expressing knowledge that is acquired prior to, or independently from, experience. In contrast, a posteriori denotes knowledge that is acquired through and on the basis of experience. A synthetic judgment refers to knowledge that is not contained in the subject matter. An example is All bodies are heavy. Here, the predicate "heavy" conveys knowledge that goes beyond the mere concept of body in general. A synthetic judgment thus yields new knowledge about the subject matter. Analytical judgments repeat what the concept of the subject matter already presupposes. An example is All bodies are extended. In order to know that bodies are extended one does not need experience, as this information is already in the concept of bodies. One would expect that analytical judgments are a priori, while synthetic judgments are a posteriori. However, Kant claims that there exist a priori synthetic judgments — knowledge that neither merely repeats the meaning of the concept under review nor requires experience to say something new about the subject matter. How can a priori synthetic judgments be identified? According to Kant, a proposition must meet two requirements in order to qualify as an a priori synthetic judgment. First, it must not result from experience, but from reasoning. Second, it cannot be denied without causing an intellectual contradiction. Mises realized that the axiom of human action is an a priori synthetic judgment. The axiom of human action says that humans act. This might sound trivial at first glance. At second glance, however, it becomes obvious that the axiom of human action has far-reaching implications. The axiom of action meets the requirements of an a priori synthetic judgment. First, one cannot observe that humans act in the first place. For doing so, one needs an understanding of what human action is. This knowledge cannot be acquired through experience, because it comes from reason and not from experience. Second, one cannot deny that humans act, for doing so would result in an intellectual contradiction. Saying "humans cannot act" is itself a form of human action, and it would thus contradict the statement's truth claim. Mises also realized that, by using formal logic, other truth claims can be deduced from the irrefutably true axiom of human action. This approach he termed praxeology: the logic of human action. 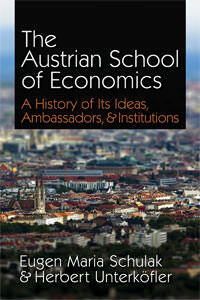 Mises reconstructed economics on the basis of praxeology. Praxeology is a priori theory. It yields propositions about reality that are irrefutably true — propositions that can be validated without taking recourse to experience. Take, for instance, the concept of causality — the idea that each effect has a cause. It is logically implied in the axiom of human action. Acting requires and presupposes the category of causality. Only a man who sees the world in the light of causality is fitted to act. In this sense we may say that causality is a category of action. The category means and ends presupposes the category cause and effect. In a world without causality and regularity of phenomena there would be no field for human reasoning and human action. Such a world would be a chaos in which man would be at a loss to find any orientation and guidance. Man is not even capable of imagining the conditions of such a chaotic universe. Where man does not see any causal relation, he cannot act. A priori theory offers an approach for reviewing, criticizing, and possibly revising commonly held theoretical explanations of historical events. When (re)viewed from point of a priori theory, what can be said about the two observations that were rolled out at the beginning of this article? Re 1: From the viewpoint of a priori theory, we can say with certainty that a rise in the fiat money supply does not raise a society's standard of living. A rise in the fiat money stock does not confer a social benefit, because money's sole function is as the means of exchange. Furthermore, a priori theory shows that fiat money exerts economically detrimental effects on the economy. Fiat money is typically created through bank circulation credit, thereby necessarily causing capital consumption and malinvestment. The fiat-money injection lowers the market interest rate to below the natural interest rate (as determined by societal time preference), thereby enabling firms producing goods and services that do not correspond to the market's true demand. It induces a boom, which must then result in a bust. The increase in production that comes with fiat-money expansion is unsustainable and will be corrected sooner or later. Output gains from fiat-money-induced activities may tend to show up earlier than the output losses that come with it, giving the sensory impression that an increase in fiat money can increase output. The truth is, however, that fiat-money creation does not increase peoples' standard of living, but rather lowers it compared to a situation in which there is no rise in the fiat-money supply. Re 2: We can say with certainty that imposing (higher and higher) taxes on income earners will lower, rather than raise, peoples' standard of living. This is because (higher) taxes (increasingly) divert scarce resources from homesteaders, producers, and contractors to nonhomesteaders, nonproducers, and noncontractors. This lowers the incomes of homesteaders, producers, and contractors, and thus necessarily raises their respective time preference. As a result, savings and investment will decline, and capital stock and real wages will grow slower (or may even decline) compared with a situation where there is no taxation. A priori theory provides true knowledge about the outer world, and the truth of knowledge derived from a priori theory can be validated independent of sensory experience. By no means less important, a priori knowledge trumps empirical knowledge: "A proposition of an aprioristic theory can never be refuted by experience." Praxeology, the a priori science of human action, and, more specifically, its up to now best-developed part, economics, provides in its field a consummate interpretation of past events recorded and a consummate anticipation of the effects to be expected from future actions of a definite kind. An a priori theorist can thus decide in advance (that is, without engaging in social experimentation, or testing, for that matter) whether or not a given action — policy measure — can bring about the promised effects. For instance, we know a priori that issuing fiat money does not create economic prosperity, that tax- or debt-financed government spending does not improve society's material well-being, and that these measures are actually economically harmful. A priori theory is an intellectually powerful defense against promises made by false theory and its detrimental (even disastrous) economic consequences if put into practice. Students of social sciences should therefore be increasingly encouraged to engage in a priori theory. Mises, L. (2003), Epistemological Problems of Economics, 3rd ed., "The Task and Scope of the Science of Human Action," Ludwig von Mises Institute, Auburn, US Alabama, p. 29. Mises, L. (1996), Human Action, 4th ed., Fox & Wilkes, San Francisco, p. 647. See, for instance, Cohen, M.R., Nagel, E. (2002 ), An Introduction To Logic And Scientific Method, Simon Publications Inc., Safety Harbor, Chapter XI, esp. p. 199. Mises, L. (1996), Human Action, 4th ed., Fox & Wilkes, San Francisco, p. 177. A highly recommendable introduction is written by Marcus Weigelt in his Introduction to Kant, I. (2007 ), Critique of Pure Reason, Penguin Books, pp. xv–lxix. See in this context a "must read" is Hoppe, H.H. (2007 ), Economic Science and The Austrian Methodology, Ludwig von Mises Institute, Auburn, US Alabama. Mises, Human Action, 4th ed., Fox & Wilkes, San Francisco, p. 22. See, for instance, Hoppe, H.H. (2006), Democracy, The God That Failed: The Economics and Politics of Monarchy, Democracy, and Natural Order, Transaction Publishers, New Brunswick (US) and London (UK), in particular his Introduction, pp. xv–xix. Mises, L. (2003), Epistemological Problems of Economics, 3rd ed., "The Task and Scope of the Science of Human Action," Ludwig von Mises Institute, Auburn, US Alabama, p. 30. Mises, L. (1985), Theory and History: An Interpretation of Social and Economic Evolution, Ludwig von Mises Institute, Auburn, US Alabama, p. 309.